Amazon made a bumper announcement last night, revealing a host of new and updated Echo devices and Alexa powered smart devices. 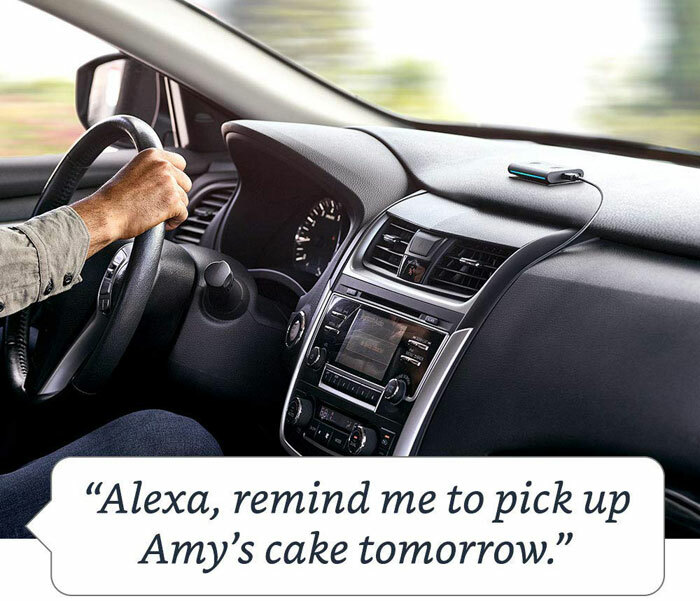 The idea is to have Alexa everywhere "in your kitchen, in your living room, in your office, and now in your car or truck," said Tom Taylor, SVP at Amazon Alexa. Taylor said the more pervasive Alexa will make users' lives easier and more convenient "whether it's asking for the traffic on your drive home, checking your email in the morning, or simply saying 'Alexa, good night' to turn off your lights and lock your door." The all-new Echo Dot comes with a new louder and crisper sounding speaker and an updated fabric design (charcoal, heather grey, or sandstone). Despite the improvements it remains the same price (£49.99 / $49.99) as the first gen device. Amazon's all-new Echo Plus is described as a simple way to start your smart home. It expands on the Echo dot offering in capabilities and stature and comes in the same three new fabric colours. The main difference is the premium speakers powered by Dolby play 360° audio. Additionally Amazon bundles this device with a Philips Hue bulb for the same price as the unit on its own. The second gen Echo Plus costs the same as its predecessor, £139.99 / $149.99. The all-new Echo Show is a new design with an upgraded speaker and a bigger 10-inch HD display. It includes the same smart functionality as the other Echo devices but adds convenient glanceable Alexa features and more. Again this comes with a charcoal, heather grey, or sandstone fabric finish. This device is £219.99 / $229.99 and comes with a free Philips Hue bulb. Echo Auto ($24.99) is a new way to add Alexa functionality to your car. The device includes an eight-microphone array designed for in-car acoustics and speech recognition technology. Amazon suggests the device might be used to "hear your morning news, listen to an Audible book on your commute, get the latest traffic updates, and more". Additionally you can set the device to turn on your house lights when you pull up at home, set reminders to pick up your dry cleaning, add errands to your to-do list and check them off when they’re complete, build your shopping list or manage your calendar - while your eyes stay on the road. At the time of writing this product is on an invitation-only availability basis. I couldn't find the above companion devices listed in the UK, so can only share the US dollar prices/links at this time. That's not all, Amazon also announced a couple of new smart home devises. Firstly, the AmazonBasics Microwave ($59.99) is a compact countertop microwave that connects to your Echo device and makes cooking easier by integrating the simplicity and convenience of voice. This microwave includes an Amazon Dash replenishment function that can auto-order popcorn kernels, so you don't run out, for example. Lastly, Amazon has launched the Amazon Smart Plug ($24.99) which facilitates the use of voice to switch on items such as lights, fans, coffee makers, and more. You just need this plus an Alexa-enabled device (or just the Alexa app on your phone) to get started with this smart plug's control and programmability. Both the AmazonBasics Microwave and Amazon Smart Plug are available for pre-order starting today and will start shipping next month (US). The Echo Dot, Echo Plus, and Echo Sub are available for pre-order starting today and ship from 11th October. Echo Wall Clock, Echo Input, and Echo Link will be available later this year, and Echo Link Amp will be available in early 2019. No new kindles though, shame. Maybe I am getting old but I don't get the microwave one. I cant see where it significantly saves you time or making it easier to quickly do something. Me neither. If you need to add more time, you're inspecting / stirring the food and so at the microwave anyway. 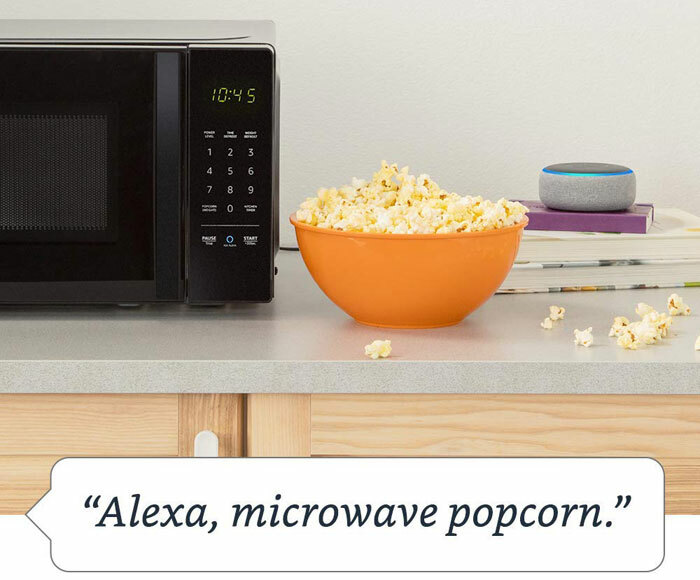 If it integrated a dot it would make a little more sense as you could have music, alexa and microwave in one unit rather than two but it doesn't. I kinda do understand the microwave thing. The controls on pretty much all Chinese microwaves are ridiculous, and the manuals are also rubbish. Heck, they could call it the Amazon Bong.